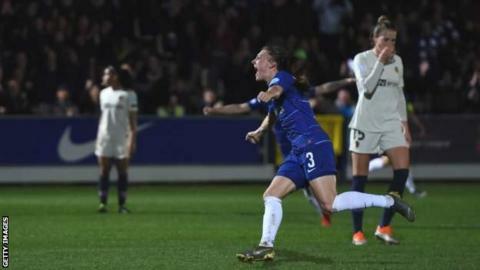 Chelsea boosted their chances of reaching the Women's Champions League semi-finals for a second consecutive year as strikes by Hannah Blundell and Erin Cuthert gave them a healthy lead over Paris St-Germain. Blundell's curler and Cuthbert's late, low finish saw the English side take control of the tie, on a night which saw an extremely unusual police incident at a women's club match. Before Thursday's quarter-final first leg at Kingsmeadow, police uncovered weapons, including knives and knuckledusters, from a coach of PSG supporters, who were denied entry. On the field, Emma Hayes' side, who are third in the Women's Super League, struggled to create chances before the break, but sprung to life after the introduction of Fran Kirby from the bench. The England forward almost broke the deadlock herself, slotting narrowly wide, before the hosts grabbed two potentially decisive goals in the final 20 minutes. Chelsea will now progress to the last four if they achieve a one-goal loss or better in Paris in the second leg next Wednesday. The best moment for PSG, who were finalists in 2015 and 2017, came when Canada winger Ashley Lawrence was denied by a strong, second-half save from Chelsea goalkeeper Ann-Katrin Berger. But the Londoners, who overcame Bosnia & Herzegovina outfit SFK 2000 Sarajevo and Italy's Fiorentina to reach the last eight, showed the greater ingenuity in the latter stages after a cagey first 45 minutes and deserve their aggregate advantage. The last English side remaining in this season's competition could have added to their lead earlier, but Sophie Ingle's powerful header struck the post when the score was 1-0. PSG are second in the French women's top tier, two points behind defending European champions Lyon. No British side has won European women's football's biggest club prize since Arsenal lifted a quadruple of trophies in 2007. Chelsea boss Emma Hayes told BBC Sport: "We were controlled, composed and experienced. It was a tactical game. It was cagey but we produced the quality in the right moments. "We're always progressing, and this team is much further ahead than it was 12 months ago, regardless of our league position. "I wouldn't say we're comfortable. That [the second leg] is going to be a 10-15,000-strong, packed crowd, and I expect it will be quite hostile, and we're going to go through difficult moments." "We have to remember that the women's game is progressing, that fans are following, and with that comes the same level of scrutiny, and ultimately they have to behave, whether it's our fans or their fans. The police dealt with it in the right way today. Asked about her side's trip to Paris next Wednesday and whether travelling Chelsea fans should be concerned, she replied: "I'm sure our security will be well-briefed. "The police took care of what they had to today, and I expect that the organisation and preparation for that will make sure that our fans are safe. I don't think we should discourage anyone from going."